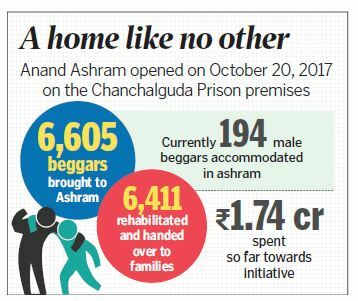 Until now, 6,605 beggars were brought to the Anand Ashram on the Chanchalguda prison premises. 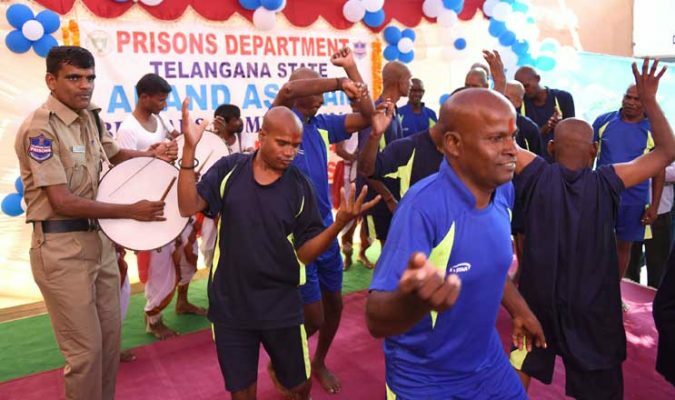 Hyderabad: The Telangana State Prison Department’s initiative to end the menace of beggars in Hyderabad, which began last year, has successfully completed a year on Saturday. Until now, 6,605 beggars were brought to the Anand Ashram on the Chanchalguda prison premises. Of them, 6,411 were rehabilitated and also handed over to their families. Currently, there are 194 male beggars who are accommodated in the ashram. Talking about the success of the initiative, VK Singh, Director General of Prisons and Correctional Services, said though he had worked in other departments, it was this initiative that gave him much satisfaction. Officials said the successful tackling the problem of begging in Hyderabad was the result of a better co-ordination between the Prisons Department, GHMC and the Police. “When we started off, we faced many questions from people. They doubted us asking how this could be possible. We have now proven all of them wrong. In the last one year, we have also treated and re-habilitated many,” Singh added. The department has spent Rs 1.74 crore towards the initiative. Things including clothes, food and other necessities were taken care of. With the success of the initiative in the capital, Singh had also written to District Superintendents of Police and other senior officials across the State to identify such beggars and send them to Hyderabad for rehabilitation. Prison officials said the beggars being rehabilitated were provided with Aadhar Card and bank accounts. And those who are healthy were helped to get loans and jobs as per their skills. A total of 34 persons were given Rs 1,000 each for giving genuine information on beggars in the last one year. The system will continue, officials said. Singh said he had requested the government to set up of Anand Ashrams across the State. “Most of the beggars found are not from the city. They come from various districts and beg here for about two hours. By the time we get information and our teams reach the spot, they are off to their native places,” he said.